In order to rectify daily heavy traffic which Metro Manila has been experiencing consistently, Public-Private Project (PPP) will reconstruct, rehabilitate, extend and operate Philippine National Railway (PNR) South Line which will be its biggest project to date. 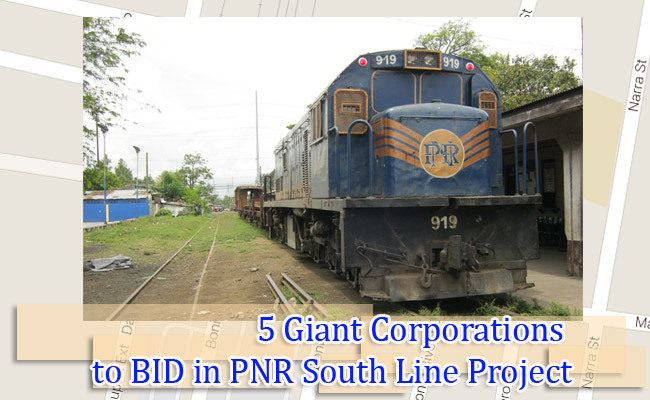 On February 05, 2016 (Friday), PPP Center Executive Director Cosette Canilao mentioned five interested firms to bid in this Php171-Billion PNR South Line project, naming: Ayala Corp., Metro Pacific Investments Corp., San Miguel Corp., IL&FS, and Fluor Daniels. The winning bidder will maintain the South Line for 34 years with 4 years of construction period. Approximately 653 Kilometers will be covered in South Line project including Metro Manila to Legazpi City and other existing branch lines. The other proposed railway operations are between Tutuban and Calamba, Laguna and an extension to Legazpi and Matnog, Sorsogon. In addition, there will also be added operations between Calamba, Laguna and Batangas. The current commuter line service of Philippine National Railway only serves around 75,000 daily commuters via Tutuban and Calamba, Laguna operations. If done in time, there will be seven train sets passing through 66 stations in 2020 and the mentioned number of passengers will increase to 316,000 per day. The main objective of PNR South Line project is to connect Metro Manila to the remaining areas in Southern Luzon which PNR has not served yet. The deadline for submission of the pre-qualification documents for this project is until March 31. In 2014 report of Japan International Cooperation Agency, Philippines loses 2.4 Billion Pesos a day just because of traffic and could even go higher up to 6 Billion Pesos per day in 2030 if this problem in traffic would not be resolved. The new PNR South Line project could help lessen traffic in Metro Manila and could help the economy at the same time.